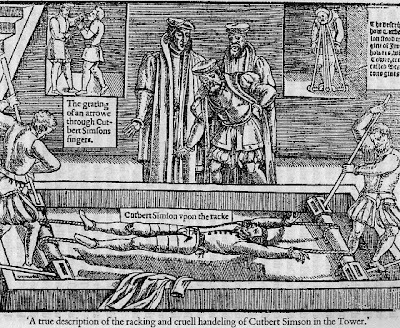 This post is the second in my series on the ethics of torture. In part one, I looked at an article by Catherine McDonald entitled “Deconstructing Ticking Bomb Arguments”. No prizes for guessing the content of that one. 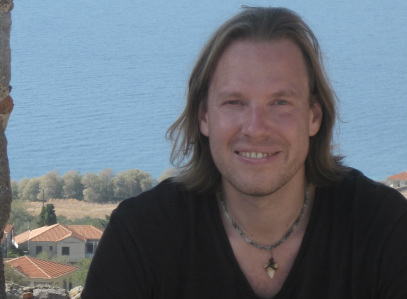 In this part, I begin to consider the arguments of Uwe Steinhoff, which are more favourably disposed toward the (extremely limited) use of torture. 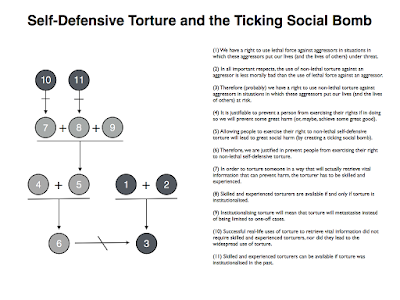 I’ll be looking at the arguments contained in the following article “Defusing the Ticking Social Bomb Argument: The Right to Self-Defensive Torture”, which, as it happens, appeared in the same journal as Catherine McDonald’s article. In part one, I presented a formal version of the — classic? — ticking bomb argument. Without restating that argument here, the basic thrust of it is as follows: in a situation in which morally unpleasant outcomes are going to arise no matter what you do, you ought to do whatever minimises those unpleasant outcomes; in the ticking bomb scenario, torturing one person in order to save many, is less unpleasant than allowing many to die; ergo, in the ticking bomb scenario, one ought to torture one person. (1) We have a right to use lethal force against aggressors in situations in which these aggressors put our lives (and the lives of others) under threat. (2) In all important respects, the use of non-lethal torture against an aggressor is less morally bad than the use of lethal force against an aggressor. (3) Therefore (probably) we have a right to use non-lethal torture against aggressors in situations in which these aggressors put our lives (and the lives of others) at risk. How are the premises supported here? Well, premise (1) seems like a widely-accepted moral belief. And premise (2) is supported by the observation that people would generally prefer to live and experience short-term harm, than to die. As you can see, this is an argument from analogy. It says that A (the right to lethal self-defence) is true in one case; that a second case is similar (in all important respects) to this first case; and so A (or something close to A) must be true in this second case as well. Such arguments are, in the words of argumentation theorist Douglas Walton, defeasible and presumptive. That is to say, their conclusions do not follow with the certainty provided by logical deduction; instead, they follow in a probabilistic and defeasible manner. What’s interesting about this argument is that its conclusion confers a right on individuals to use torture in self-defence. This is very different from the conclusion of the ticking bomb argument which can be phrased in terms of a limited exception to a widely-recognised negative right (i.e. the right not to be tortured). In other words, Steinhoff’s argument is an inversion of the typical pro-torture argument: it argues from a threshold deontological position, as opposed to consequentialist position. This clever inversion allows him to construct an equally clever inversion of the ticking bomb argument. He calls this the ticking social bomb argument. Let’s see what this is. The ticking social bomb argument is derived from an objection to the standard ticking bomb argument. We encountered this objection in part one. To recap, recall how the ticking bomb argument relies on a consequentialist calculation of the respective merits of torturing one person to save many versus allowing the many to die. Now recall how McDonald, as part of her deconstruction of the standard argument, challenged this calculation on grounds of short-termism. She argued that allowing torture in extreme circumstances would lead to the legitimisation of torture in the long-term, which would in turn lead to the corruption of important social institutions and the dissolution of trust across society. (4) It is justifiable to prevent a person from exercising their rights if in doing so we will prevent some great harm (or, maybe, achieve some great good). 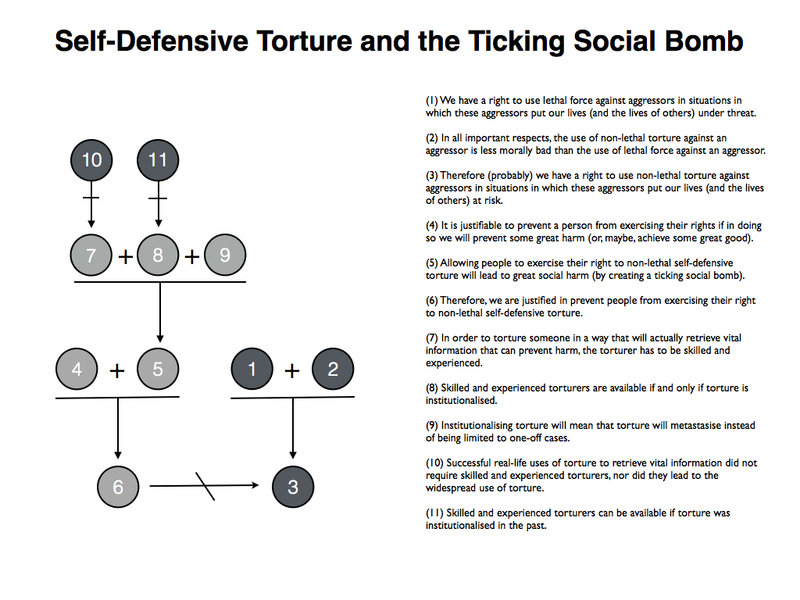 (5) Allowing people to exercise their right to non-lethal self-defensive torture will lead to great social harm (by creating a ticking social bomb). (6) Therefore, we are justified in prevent people from exercising their right to non-lethal self-defensive torture. Steinhoff identifies (5) as the key to this argument. His goal in the remainder of his article is to suggest that opponents of torture have no good arguments to offer in support of that key premise. He uses the writings of Henry Shue as his main scratching post. Surprisingly for an article of this nature, Steinhoff’s discussion of Shue’s work is remarkably ill-tempered. Now maybe Shue deserves it; and maybe I’d feel the same if I had been trading blows with him on this issue over a number of years (as Steinhoff has), but still I found the whole thing slightly unnerving. Luckily, there is some quality analysis beneath the vituperative language and I’m going to focus my attention on that. [I]t is simply dreamy to think that all of a sudden we are simply going to stumble upon someone who happens to have the skills to make a man who planted a ticking bomb reverse the direction of his life and assist us in defusing the bomb….Either “torturers” are just thugs who have no clue what they are doing, in which case we need not allow for exceptional cases in which they rapidly and effectively extract invaluable catastrophe-preventing information, or some can have genuine expertise…If we want [such expertise] ready, we need to maintain, even nourish, organizations and networks in which the expertise resides. (7) In order to torture someone in a way that will actually retrieve vital information that can prevent harm, the torturer has to be skilled and experienced. (8) Skilled and experienced torturers are available if and only if torture is institutionalised. (9) Institutionalising torture will mean that torture will metastasise instead of being limited to one-off cases. Ergo, allowing torture for self-defensive purposes creates a ticking social bomb. What does Steinhoff have to say in response to this argument? Well, he’s quite happy to concede that the institutionalisation of torture — which could involve a system of torture warrants, and professional torturers — would be a very bad thing indeed. Hence, if it were true that effective self-defensive torture required institutionalisation, then Steinhoff would reject it. He just doesn’t think this is true. In other words, he rejects premises (7) and (8). 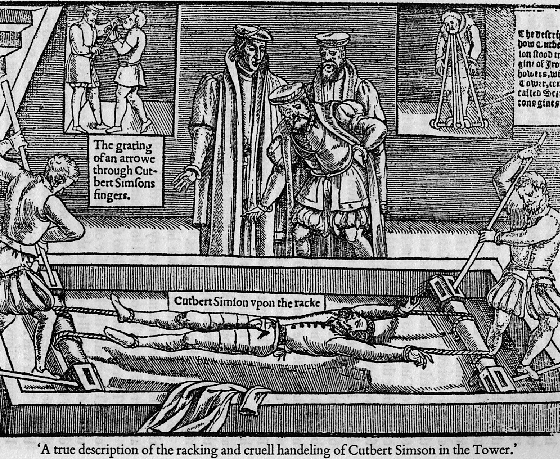 (10) Successful real-life uses of torture to retrieve vital information did not require skilled and experienced torturers, nor did they lead to the widespread use of torture. As against (8), Steinhoff points out that having access to skilled torturers need not require the existence of a torture bureaucracy; it would be enough if such a bureaucracy existed in the past and one had access to its officials. To put it another way, there are probably enough secret police officials out there in the world who, due to the unpleasant histories of the countries in which they lived, were skilled torturers. (I’ve put this point in the argument map below as premise 11). This then brings us to the end of Steinhoff’s main critique of the ticking social bomb argument. He goes on in the final section of his article to make the point that the child-kidnapping case is a more persuasive instance of the justifiable use of torture than the ticking bomb case, but I won’t get into that here.